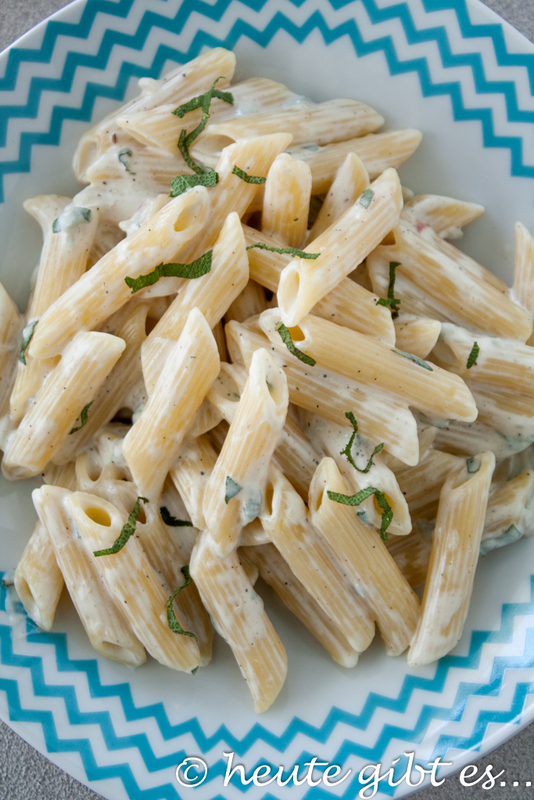 Do you fancy a really delicious, creamy pasta sauce? Nothing complicated, for which you do not have even stand forever in the kitchen? 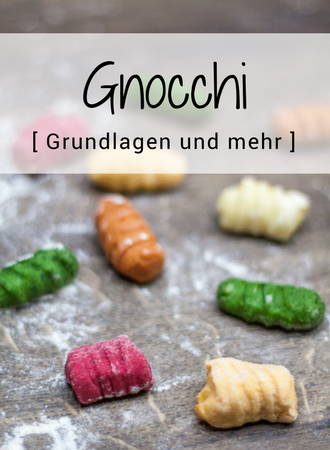 Then I might be just for you: Gorgonzolasoße! This desire have mainly Facebook expressed some of my readers, which is why I would like to fulfill this today. 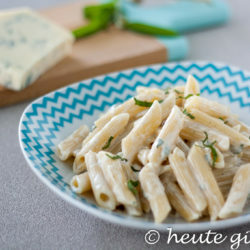 A cream sauce that is missing in the Maiedition my blog series on “classic Italian pasta sauces”, After today's recipe you have in my opinion a small but fine repertoire of sauces classics. But let's get back to today's court. Probably one or the other when reading the word “Gorgonzola” equal to or clicked away grimaced. A few years ago I would have probably also heard, for solely with the idea that people eat a cheese with mold, I was more than bad. At some point I dare to try me a pizza Quattro formaggi and behold, this may also have tasted me despite or perhaps because of Gorgonzola cheese. When using the Italian blue cheese, it is very important to choose the right variety. A distinction Gorgonzola dolce and Gorgonzola piccante. 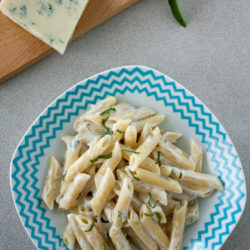 Due to the shorter ripening period of about 60 days of Gorgonzola dolce is milder in flavor and has a creamy consistency. Therefore, this is perfect for sauces, but also very often simply smeared on the bread. The Gorgonzola piccante had with 90-100 days a much longer maturation period is spicy in taste and also solid in consistency. This is very often combined with meat or cheese served on a plate with figs or pears. In Italy, only for cooking “Cooking cream” used. Although the German translation is this “cooking cream”, But this has little to do with the cooking cream, which can be bought in German supermarkets. Cooking cream usually has a lower fat content than whipped cream (about 15%) and differs optically even out of this. In the Italian version of the fat content is still high (over 20%), where it is thick in comparison with the whipped cream. By a German product, the Panna is unfortunately impossible to replace, and certainly not by products that can be purchased commercially and become pure chemical cocktails. Panna da cucina you will definitely get in Italian supermarkets. German retailers me this has not really noticed, but I have to admit that I've never been before explicitly looked after. If you have no way to come to the Italian cream, I would use regular whipping cream, let the sauce boil down initially and again add a little dash of cream at the end. This is probably the desired result come closest. 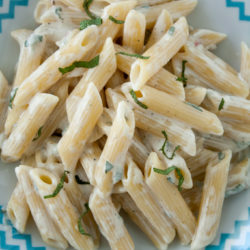 bring to a boil in a pot of salted water for the pasta and cook the pasta is al dente. Meanwhile, the cream, give the diced gorgonzola and some ground pepper in a small saucepan and bring over a low flame stirring the cheese to melt. Meanwhile, the shallot finely chop and wash the sage leaves, pat dry and cut into thin strips. The shallots soon as the cheese is melted stir among the gorgonzola sauce and the sauce briefly for 2 minutes – still over low flame – leave on the stove. Then remove from heat, season with salt and set aside. The al dente cooked pasta drain well and give back to the now empty pot. Now the sauce and sage stripes add, mix well and serve warm. If desired, with chopped sage leaves garnish. 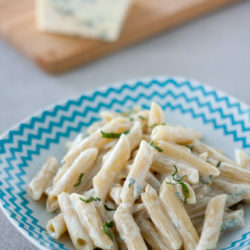 If your guests do not like Gorgonzola, you can this course by another soft cheese replace the taste of the result depends on the selected type of cheese. If you like can also vary very slightly the sauce by example chopped nuts or seared bacon is mixed. Starting with next Sunday, a new monthly theme starts to Italian cuisine. Curious what it is? Then just stop by and let yourself be surprised! 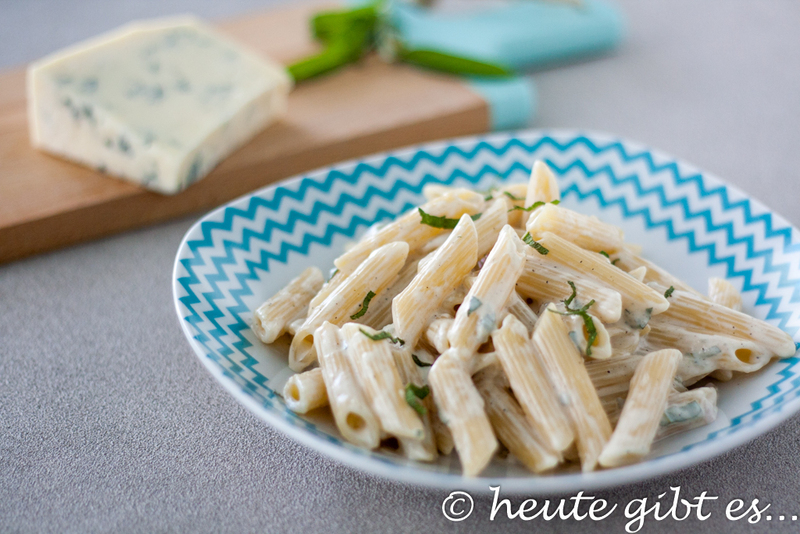 8 Kommentare zu "Pasta alla crema di Gorgonzola – Pasta with creamy cheese sauce"
Pastry cream / pastry cream might be worth NEN attempt. Which also has a higher fat content compared to the whipped cream. I mean so around 35%. I must admit that I've never used pastry cream. Is this also thicker than normal cream? 'm going to buy a pack and see if this is comparable. Thank you in any case for the tip! Hello Elena, you can predict sweat a bit and then add the cream and gorgonzola, the shallots, too? that is exactly my case. 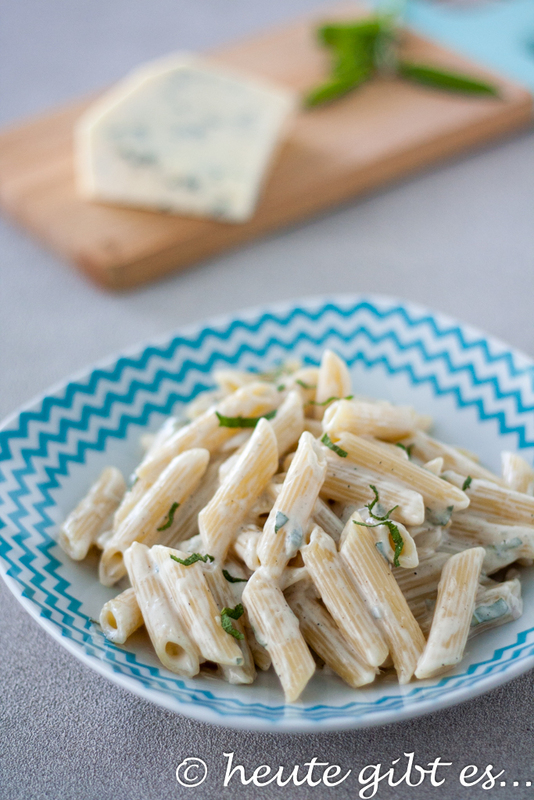 I love pasta with Gorgonzola. but so quick to prepare but at the same sososoooo delicious. I am pleased that I have met your taste 🙂 let it taste you in any case! 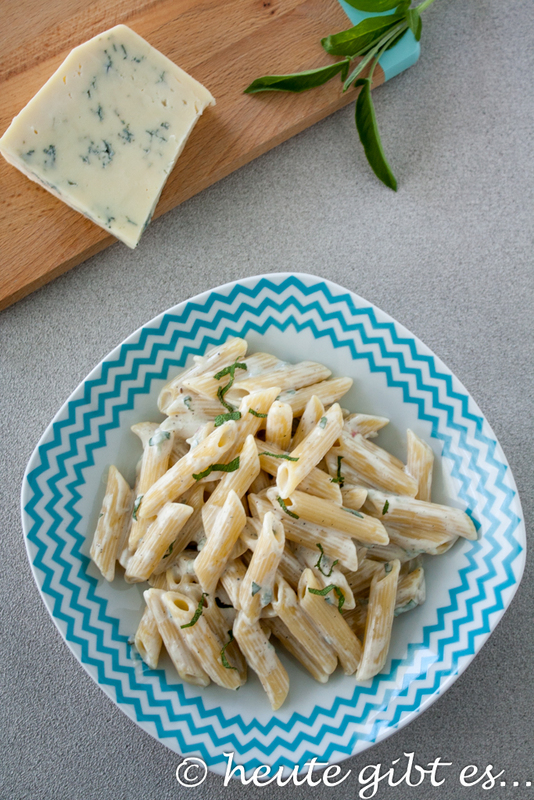 Pasta and gorgonzola simply belong together! Do I have to cook again!